My stomach growls in unison with the beeping of my alarm clock. It’s morning, and I’m hungry. I roll out of bed, put on my slippers and my worn-in Bradley University sweatshirt, and make my way to the kitchen. Weekday or weekend, this is pretty much my routine. I always make time for breakfast — my stomach wouldn’t have it any other way. Because more often than not, I wake up hungry. I usually start the day with eggs (1 whole, 1 white), half an avocado and a hearty dash of Cholula. A big mug of coffee and a tall glass of water are usually present, too. This is my standard. I rarely ever grab cereal, but when I do, it’s usually granola. We have some really great pre-packaged local granolas here in Chicago (I particularly like Rick Bayless’ mix from Milk & Honey), but honestly, it’s pretty damn easy to make yourself. And even better, you can customize it however you like. This is my current favorite. And of course, in true Fresh & Foodie fashion, it has a kick of bourbon. I’m sure you wouldn’t have expected anything less. *I used Burton’s Maplewood Farm Bourbon Barrel Aged Maple Syrup that I purchased at Green City Market, but other hight-end brands like Blis are easier to find. I know it’s a little pricey, but trust me — it’s very worth it. You could also use straight up maple syrup, but be sure it’s the real deal. No Aunt Jemima’s here. In a large bowl, whisk the egg whites, melted coconut oil, maple syrup, salt, nutmeg and cardamom. Add the oats, coconut, almonds and macadamias, stirring well to combine. 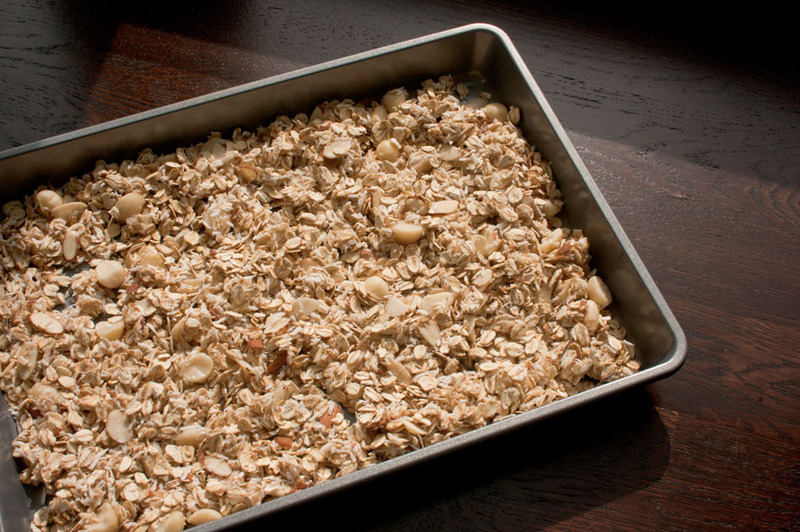 Spread granola evenly on a rimmed baking sheet (I used two baking sheets to give the granola some room) and bake for 15 to 20 minutes, or until the granola is golden brown. Remove from the oven and add the dates, tossing well to combine. Let cool before storing in an air-tight container. Serve as-is, with yogurt or milk, or however your heart desires. A little bourbon in the morning sounds alright to me. as an avid fan of both granola and bourbon i thank you. this sounds delighful! You should definitely get yourself a bottle of bourbon barrel-aged maple syrup then! This sounds amazing! 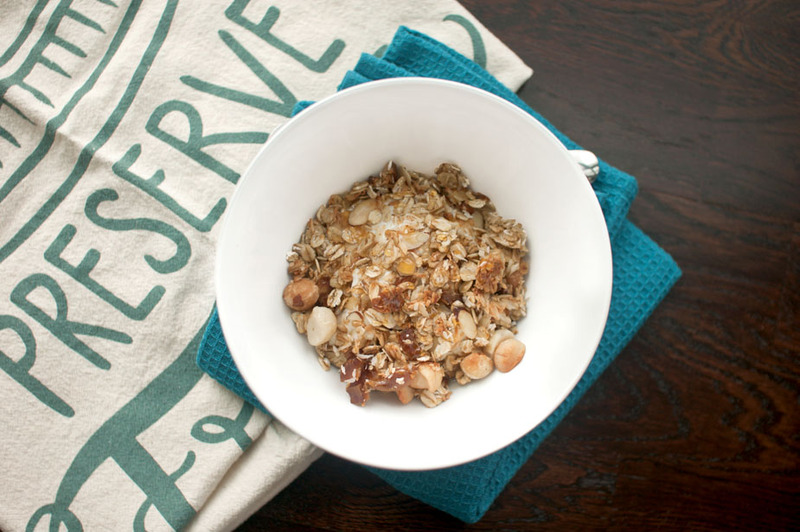 Bourbon in granola can’t be wrong. Pinned it! I’ve never made my own granola before but I’m a huge fan. This one looks awesome! I love bourbon. This recipe looks delicious. I’m a big fan of granola in the morning.